SOLANA BEACH — “I’m truly honored and humbled to be with you to share the precious camaraderie of Veterans Day,” Sgt. Maj. Mark O’Loughlin said during the annual ceremony marking the Nov. 11 holiday at La Colonia Park. “We’re all gathered here to recognize the selfless sacrifice of all American veterans past and present,” he added. “We continue to pray for God’s grace and guidance for America because America was founded by, and the Constitution was written by, fallible human beings. O’Loughlin is a 30-year decorated Marine who was deployed three times during Operation Desert Shield, Desert Storm and Desert Saber and four times to the Persian Gulf and Iraq. As this year’s guest speaker, he shared a message of patriotism and the importance of respecting the symbols of this country’s freedom and democracy. The country’s flag, “in all its majestic beauty … does continue to fly above the land of the free and the home of the brave … because of the selfless actions of all the great veterans sitting here today” who took an oath to support and defend the Constitution against all enemies, foreign and domestic, and bear true faith and allegiance to the same. “Ladies and gentlemen, there was no expiration date with that oath,” O’Loughlin said, adding that our nation is “unfortunately … under siege by dark, subversive forces” using the flag and the national anthem as tools in that subversion. He said athletes who take a knee or refuse to stand for the national anthem are a symptom of that subversion. “The most pathetic thing is they’re using the red, white and blue,” O’Loughlin said. “They’re using the American flag, the flag that covers the casket of the fallen warrior as he’s brought back to his homeland, the flag that is tenderly folded and gently handed to the loved one of a fallen warrior,” he said. He cited The American’s Creed, written in 1917 by William Tyler Paige as an entry into a patriotic contest and adopted as a resolution the following year the by U.S. House of Representatives. “I believe in the United States of America and the government of the people, by the people, for the people, whose just powers are derived from the consent of the governed … established upon those principles of freedom, equality, justice and humanity for which American patriots sacrificed their lives and fortunes,” it reads. O’Loughlin also said it’s important for people to stay involved in their government. 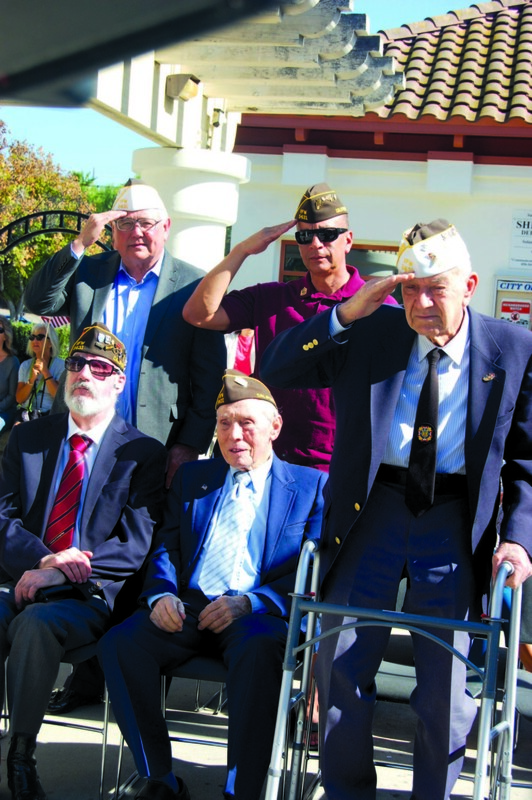 The ceremony, co-hosted by the city and the Veterans of Foreign Wars Post 5431, was attended by VFW members representing all branches of the military, the Camp Pendleton Young Marines and area residents. The Santa Fe Christian High School band performed a medley patriotic songs. “We stand together today honoring those who have faced tremendous odds and struggles to protect our freedom,” Marshall said. “Our hearts go out to those who put themselves in harm’s way each and every day continuing the fight for freedom, protecting our nation both at home and abroad. “Let us resolve to never stop working to defend our freedom and enjoy a better world for which our veterans have sacrificed,” she added. With her father’s flight helmet on the podium, Marshall acknowledged John Marshall, who served 13 years in the U.S. Navy providing ground support from an AD. “He told me that was a one-person plane that carried a lot of bombs,” Marshall said of the Douglas A-1 attack aircraft. The ceremony began with the Presentation of Colors by Camp Pendleton Young Marines and ended with “Taps” and the release of white doves.